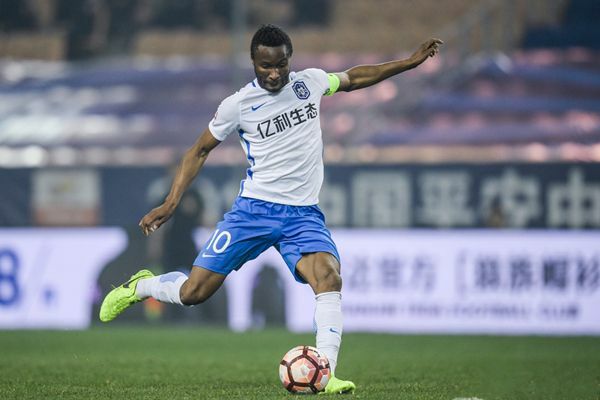 Super Eagles captain, John Obi Mikel, was in top form, as his Chinese side, Tianjin, secured a four goals victory over Tianjin Quanjian in last weekend’s Chinese Super League game, courtesy of two goals from Ghanaian forward, Frank Acheampong. Tianjin Teda have battled relegation, after being winless in the last two months, but two goals from Acheampong within a space of two minutes in the 25th and 26th minutes respectively set them on the path to a morale boosting win. Captain of the senior Nigeria national team, John Obi Mikel, was as usual one of the star performers of the team, who are off the bottom of the table in the Chinese Super League courtesy of the win. Mikel was on for the entire duration of the game and bossed the like of Axel Witsel who was up against him during the course of the game played at the Tianjin Olympic Center. With big win, Mikel and his Tianjin Teda side has moved to the 14th position from its former 16th place, with 19 points, after 25 games in the Chinese Super League.